Silvio Varviso (1924-2006) usually enters the musical reckoning as a conductor of operas. I recall that his Meistersinger set was well thought of. 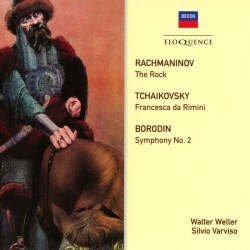 I do not remember any other Varviso orchestral LPs but this is very good indeed - especially the Borodin. Walter Weller (1939-2015) has had more exposure on disc and his The Rock was part of a Rachmaninov symphony cycle. The Borodin and Tchaikovsky first appeared on Decca LP SXL6352 and the Rachmaninov in company with the 3rd Symphony on Decca SXL 6720. The present revenants are superbly interpreted and recorded. They derive from Decca's halcyon vintage. The strings are not as opulent as they could be with other orchestras but the overall effect remains stunning. The quality of the OSR playing usually comes in for a bit of a kicking but here I dissent. The LPO are caught to gorgeous and transparent effect in The Rock - a score that comes across as Ravel out of Balakirev out of Rimsky. They are recorded in the Kingsway Hall - once sovereign among recording venues. This early Rachmaninov piece can be counted as a product of this composer's nationalistic roots. It is immature when compared with The Isle of the Dead and Symphonic Dances but in its pellucid orchestration it need not blush in the company of Balakirev's Thamar, Rimsky's Sadko or Borodin's Prince Igor. Rachmaninov worshipped Tchaikovsky and that's clear from the throaty-dry, brassy gauntness towards the end of the Fantasy. Weller relishes all those sea-green sighs and swells. Borodin's Second Symphony, in which the OSR is conducted by Varviso, turns out to be one of the most potently exciting readings. The OSR is on great form - take the wonderfully punchy kinetic playing of the French horns but generally the playing is superb. Still drawing cheques on the orchestra's years with Ansermet they excel and the recording is excellent. The OSR achieved similar heights under Horst Stein in its Sibelius forays in the 1970s with Pohjola's Daughter and especially En Saga: very special music-making heard in a stunning recording (Eloquence 482 3922). I have mentioned Tchaikovsky and he is represented on this disc by the most moving and supercharged of his tone poems. Varviso's Francesca da Rimini — also set as an opera by Rachmaninov — has the conductor in the role of the Duke of Hell letting loose excoriating blast-furnace whirlwinds and a supernatural Don Juan serenading the audience in the long central section. He's a degree hotter than the classic Stokowski (Everest) and has the edge on the wild-eyed Vyacheslav Ovchinnikov (Olympia OCD139) in terms of sound quality. Varviso comes closest to the extraordinary live concert performance by the LSO and Yuri Ahronovich in 1979 at the RFH which peels wallpaper and shakes foundations; when is someone going to find a good tape of that incandescent event and issue it? Varviso does not pull things about as much as the voluptuously inclined Ahronovich. Even so this performance indicates how toweringly special Francesca can be in the right hands. The notes, which are in English only, are by distinguished Eloquence regular Raymond Tuttle. It is strange that Varviso was so little used for orchestral fare. He and Weller show up very well in these invaluable and terribly exciting analogue reissues.